Of course, simply having a website isn’t enough. It has to be maintained and kept current to remain relevant in the eyes of consumers and web crawlers alike. Regardless of your dedication to customer support or how outstanding your products or services may be, failure to revise certain aspects continually seen by the public could negatively affect your business before potential customers even consider giving you a chance. You’re a customer care champion, and this needs to be shown on your website. When most of your business comes from online traffic, it would behoove you to keep the presentation of your products and services relevant to your target audience. 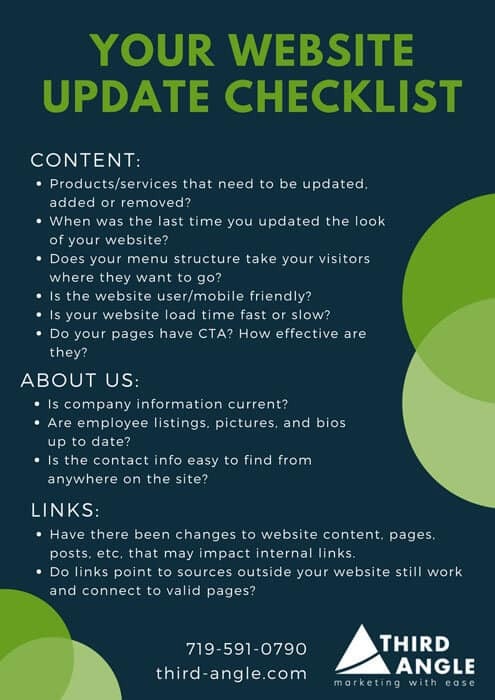 Use this website update checklist to give you an idea of the factors you may be overlooking. Keeping relevant and updated information on your website for your products and services indicates you are legitimately concerned with giving your audience the best you have to offer. Your website has some tell-tale signs that you need to be aware of because your customers are more aware of these details than you realize. Is your web content up to date? Is there any new content that should be added to clarify your offerings? Is your contact information correct and easy to find? Have a friend who could be in your target audience sit down and look through your website through the lense of constructive criticism. Write down questions they have and then GO clarify their questions on your website so your whole audience understands. Scroll to the bottom of your company website and check the copyright. If it still says 2015, or perhaps another year in the more distant past, you want to bring it into the present. While some viewers wouldn’t notice, others are paying attention, and it could be the first clue you’re not making regular updates. This may not be the most vital element of a site, but it’s actually the most neglected and one of the easiest issues to correct. And make sure your customers can get a hold of you. Check phone numbers, email addresses, and the company snail mail address if you want one to be associated with your business. If any of those have changed, be sure to update them on your contact page, in the footer, and on any other pages. These are the only ways customers have of reaching you, and if it’s not accurate, it’s going to affect your lead generation and bottom line. Test all forms to be sure they’re still working as intended both for visitors and the employees receiving them once submitted. This interaction is incredibly valuable to your business and needs to be on your checklist. Across the board marketing and SEO experts concur that the "About Us" section is the most visited section of most websites. Modernizing your "About Us" page to accurately reflect your brand, your company culture, and your employees is vital to portraying your company's image. Have you fired, hired, or promoted anyone since your last update? If so, add or remove the necessary personnel and be sure all mentioned job titles are accurate. Read over any content about your company and its history as well. Add in new certifications, credentials, services, products, awards, and other pertinent information as necessary. Is the company information current and up to date? Are your employee listings, pictures, and bios up to date? Links serve a few key purposes. Internally, they allow viewers to quickly and easily navigate among different areas of a website. You probably also have links from your site to others, giving visitors portals to helpful information and establishing your company’s authority in its field. Click through EVERY link to ensure each is functioning properly. If your links lead to 404 pages and dead ends,you are losing credibility to your users. For bonus points, do a brief run-through of any companies and sites connected to those external links to be sure none of them have received bad reviews or suffered other negative issues since previous annual website updates. Have there been changes to website content, pages, posts, etc, that may impact internal links? Do links point to sources outside your website still work and connect to valid pages? A picture is worth a thousand words, and about 40 percent of Internet users admit they gravitate more toward photos than written content. This means showing people what your company does could be more effective than trying to tell them, so being sure your portfolio or photo gallery is up-to-date is crucial. Whether you’re selling outfits and accessories, or bathroom remodeling services, displaying what was trendy three years ago could send prospects scrambling for more modern operations. Are there products/services that need to be updated, added or removed? When was the last time you updated the look of your website? Does your menu structure take your visitors where they want to go? Is the website user/mobile friendly? Is your website load time fast or slow? Do your pages have CTA? How effective are they? Any upcoming promotional events also need to be brought to light during this phase, as they could work in your favor. If it’s been a while since blog posts or informational articles have been updated, develop a plan of attack in this arena as well. You’ve checked to make sure your website looks great and links are working properly, but there may be some other underlying factors that keep your site from getting the traffic you’ve worked so tirelessly to attract. It always good practice to monitor your security issues, software, plugins, and any other features used to keep your website running ship-shape. Are software and plugins up to date? Are you using software that is no longer supported? When was the last time you performed a security scan on your website? Is your login page hardened? Depending on the platform you’re using and your level of skill in this genre, you may need to enlist the help of a professional when implementing a website update plan. The items covered in this website update checklist are a few of the most critical points for small businesses today, and they could mean the difference between drawing in new customers or appearing obsolete in the eye of the beholder. Do you want to learn how Third Angle approaches web design? "Yes, I do!"